To another Chick-fil-a Grand Opening. 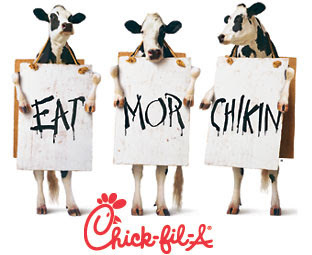 Matt and two of his friends from the seminary left today after class (at 12:15) to travel to Joplin, MO to another opening of a new Chick-fil-a. They had the car packed up with warm clothes, sleeping bags, extra socks and blankets. Joplin, MO is about 4 hours south from St. Louis which makes it about 10 degrees warmer but it will still be in the 30's tonight. Those boys will do anything for FREE CHICK-FIL-A! The guys called to the opening today and at about noon there were only 10-15 people there. I hope after a four hour drive the boys come away with their 52 free value meals. Matt said before he left, "Well, I am going to be the hunter and gatherer today." Dan it! Wish I would have known...that would be a great way to save some moo-lah (pun intended). Hah! Supposed to be "Dang it"